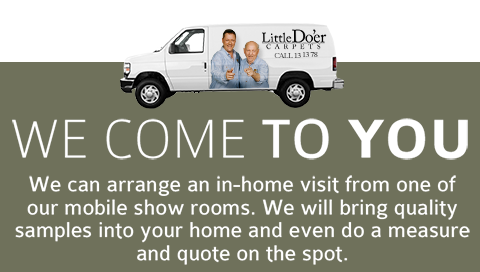 The Little Doer Carpets have been specialists in floor coverings for over 40 years in Sydney. Many Sydney-siders are sure to have grown up with “Tell ’em the price, son!”. We are one of the leading flooring companies in Sydney and we specialise in carpet, timber laminate and vinyl floor coverings in Sydney and the surrounding areas, from the North Shore to Bella Vista, Parramatta and Burwood. Over the years, we have built a solid reputation among our clients for our honesty, hard work and our specialist services. We are proud to be a 100% Australian owned and operated company and we go out of our way to meet all of our customer’s needs. How do we solve your flooring needs in Sydney? Our mobile carpet showroom in Sydney is unique amongst Sydney retailers and is a home service that is free to all of our customers. Our customers no longer have to struggle to match their floor coverings in Sydney to their decor, as our in-home mobile service allows all of our clients to make the right choice of carpet, vinyl or laminate to match their wall colours, tiles, blinds, and furniture right in their own home. As specialist flooring contractors in Sydney, we have experienced representatives who are able to help you decide which flooring is best for your needs and to talk you through the process of replacing your old carpet. Apart from helping you select your flooring, we can also arrange to move your furniture out of the way and we can also remove and dispose of your old carpet and underlay as well. All it takes is a quick phone call and our Sydney carpet showroom will be at your home in no time at all. As a family business we take pride in all of our work and have a strong recommendation and referral rate as a result of our “to be done how you would want in your own home” attitude. When you need expert flooring installers in Sydney, don’t delay, call 13 13 78 for an obligation free measure and quote.